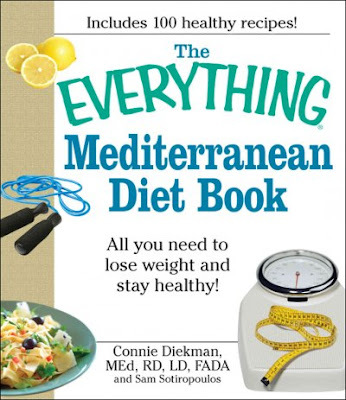 If people really are what they eat, then I am convinced that Greeks (and many Italians) are in no small part composed of various pulses. Growing up in a Greek household means that you have either learned to enjoy or to dread that next meal consisting of beans, lentils, and/or chickpeas; whether they are dried, fresh, roasted, baked, or boiled, believe me, we have had our fill. True Greek soul food. Click to Enlarge Image. 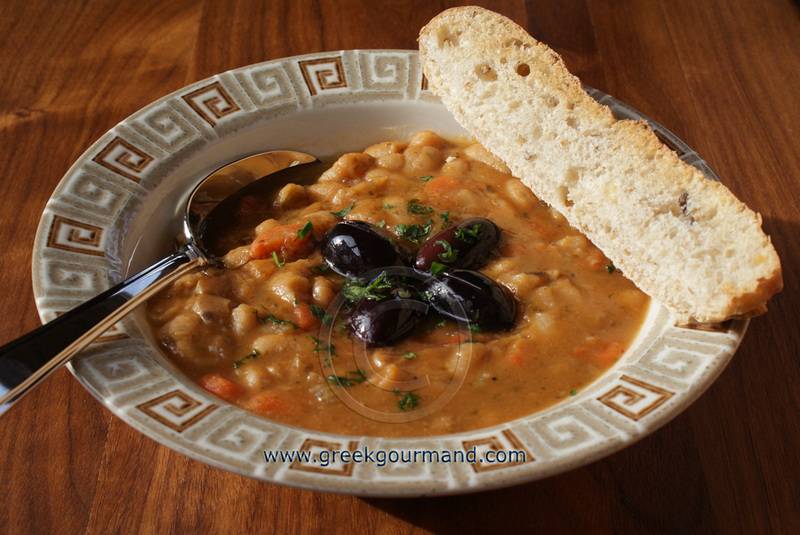 Since the remotest antiquity, pulses have been a fundamental staple of Greek food culture. Indeed, beans were such a familiar item to Homer that he used a bouncing bean simile to describe the manner in which an arrow deflected from the armour of King Menelaus in a mortal encounter (Iliad, Book XIII, 589). And depending on whom you believe, Pythagoras either admonished against, or eagerly encouraged his fellows in the consumption of beans. This is my own version of the rustic bean soup which is a Lenten friendly dish and makes for a hearty vegan meal. 1 cup tomato sauce (i.e. pommodoro) or 3 finely diced tomatoes. Soak beans overnight in roughly three times their volume of water. Dump beans into a colander and rinse well before use. Put 3 quarts of water in a pot, add the beans and bring to a boil over high heat. Skim away surface foam as it develops. Boil beans for 15 minutes, continuing to skim away surface foam using a wooden spoon. At the 15 minute mark, skim off the last bit of foam and dump the pot’s contents into a colander to strain and rinse the beans. Also rinse the pot well. Put another 3 quarts of fresh water in the pot, bring it to a boil and add the beans. After 5 minutes, skim any remaining surface foam that may develop, and then add all of the remaining ingredients into the pot. Stir the contents of the pot well and when it has resumed boiling, cover the pot with its lid slightly ajar and let it simmer over low heat for 2 hours (or until the beans are soft). Stir occasionally and check to ensure ample liquid in the pot to keep the beans from sticking to the bottom. Though it is technically a soup, you do not want a very runny fassoulada, nor do you want one that is thick and gooey, so monitor the water content of the pot and add a cup or so if necessary. 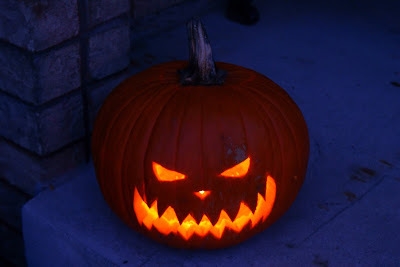 This past January marked the second anniversary of this blog. In the last couple years, my writing about Greek food and gastronomy has brought me into contact with many wonderful people from all over the world. Food is truly the most enjoyable and effective means of bringing people from diverse backgrounds together in convivial fellowship. I look forward to many more years of writing about Greek food and connecting with like-minded folk throughout the world via the Internet, and in meatspace whenever possible. Two of the people I have met through this blog are inspirations when it comes to publishing food related content on the Internet. Last April, I finally had the opportunity to meet Chef Mark Tafoya and food philosopher Jennifer Iannolo, co-founders of the Culinary Media Network. While visiting from New York on a food media junket, Jennifer and Mark put out a call for an impromptu 'tweetup' of Toronto foodies. 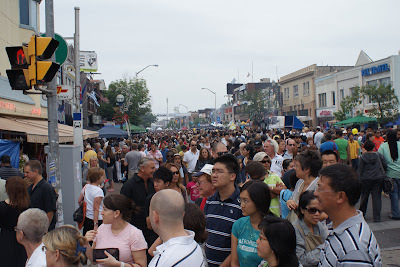 Upon discovering that Mark and Jen's junket itinerary did not include a visit to Toronto's Greektown, I extended an invitation to show them around my 'hood. The following video is a chronicle of that visit. We had a great time that day and I think it shows! I want to extend a special "Thank You!" to Chris and Soula of Pan on the Danforth for their gracious hospitality. Hope you enjoyed the video, and I hope you have enjoyed this blog over the past couple years. This year, I plan on taking things in a new direction and I have some exciting announcements to share in due time, so stay subscribed! As always, I look forward to your comments. According to Greek Mythology, the island of Cyprus takes its name from the goddess Aphrodite, which makes the island her own special abode. I have never been to Cyprus, though I have heard of its natural beauty, and I do have a number of Cypriot friends. Toronto has a sizable Cypriot community, and over the years, I have had a chance to learn something about their ways and means. I have also had a chance to sample some of their foods. There are many similarities between the foods of Greece and Cyprus, but there are notable differences too. At the invitation of the Consul General of the Republic of Cyprus, Mr. Stavros Avgoustides, I had a chance to sample some specialties of that island nation. 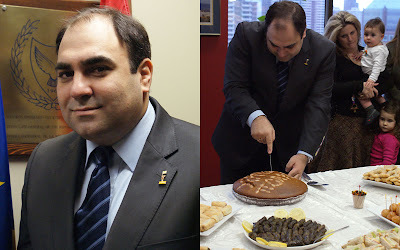 Last week, I had the pleasure of attending the annual cutting of the Vasilopita at the Cypriot Consulate in Toronto. It was a small, intimate affair which included family members of the consulate staff, the consul general and staff from the nearby Greek Consulate, local community leaders, and last but not least, yours truly. Mr. Avgoustides was also happy to answer some questions I had prepared for him about Cypriot cuisine. Seems he and I share a common interest in food and uncommon anecdotes which relate to its preparation and consumption. Suffice it to say, I enjoyed our interview, his answers were informative and interesting. He was also kind enough to provide a recipe for Koupepia, a stuffed vine-leaf recipe which is similar to Greek dolmades, yet different and very tasty. 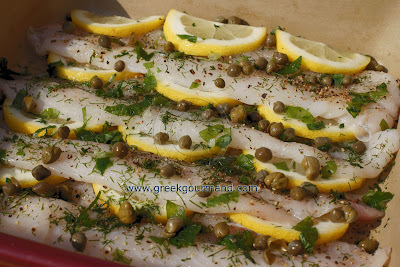 Q: What would you like my readers to know about Cypriot cuisine? A: Cypriot cuisine is shaped by the island's Mediterranean climate, its geography, culture and history. 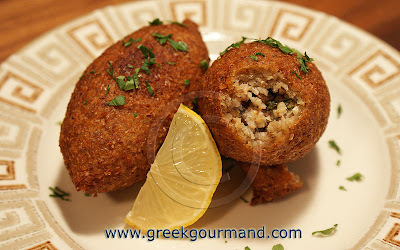 It is a unique blend of Greek, African and Middle Eastern dishes. Q: If there was one dish that you would associate with Cyprus, what would it be? A: Kolokasi- A root vegetable (colocasia esculent) rather like a sweet potato cooked in a casserole with pork and celery in tomato sauce. They say that Richard the Lionheart had kolokasi at his wedding feast in Limassol in 1191. I think Cypriot Mezedes is considered the most famous dish or combination of dishes. 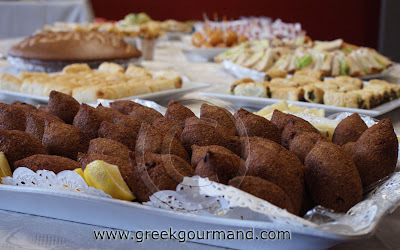 On Cyprus, Mezedes is a rich selection of appetizers and savouries in up to 20 saucerlike dishes! They include: fresh and pickled vegetables(cucumber and "kapari" - pickled caper stems), "elies tsakistes" ("crushed" green olives with a dressing of lemon, garlic, herbs, coriander seeds and oil), "Lounzta"(smoked and marinated loin of pork) and "Chiromeri" (marinated, smoked and pressed ham), "octapodi krassato"(octopus in red wine), grilled "halloumi" (local cheese made from sheep's milk), "tallatouri" (yogurt with cucumbers, garlic and mint), "melitzanosalata" (aubergines with spices), "tashi" dip (crushed sesame seeds - tahini paste, garlic, lemons and olive oil), "hummus" (made from yellow peas with olive oil and parsley), "Pourgouri Pilafi" (Bulghur - Cracked Wheat Pilaf Prepared from hulled wheat), "Cyprus salad" (a mix of fresh tomatoes, lettuce, coriander leaves, rocket leaves, cabbage, cucumbers, onions and black olives). "Koupes" (cigar shaped wheat cases with meat filling), "Halloumi Cheese Ravioli", "Karaoloi yahni" (snails in tomato sauce), "Tavas"( meat with onions, vegetables and spices, cooked and served in a clay pot), "Afelia" (small pieces of pork cooked in red wine and crushed coriander seeds). "Kleftiko" (lamb baked in a clay oven). 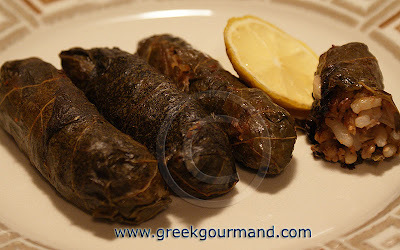 "Koupepia" (rice cooked with onions, tomatoes and herbs, then wrapped in vine leaves). Q: What are your favourite Cypriot recipes (i.e. appetizer, main course, dessert) and do you cook them? A: Difficult question... Almost all Cypriot recipes are among my favourites. If I am forced to narrow down my choices, they would be as follows. For an appetizer I would prefer to eat Halloumi cheese grilled over a charcoal fire and when at home my mom prepares these Halloumi toasted pita bread sandwiches . As a main course, I would choose barbequed Pork Souvlaki Kebabs and Sheftalia (minced pork in caul fat) served in envelope shaped pita bread. Also, "Moujendra" - lentils and rice (mixed) with fried onions (a must!!! ), "Souvla" (large chunks of lamb, flavoured with fresh herbs, threaded onto a spit and grilled over charcoal), and "Ofton Kleftiko" (Lamb in the oven): this dish got its name from the word kleftis (robber), and they say that in the past mountain men would cook their stolen meat in sealed underground ovens. 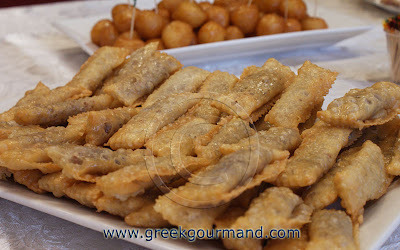 For dessert, "Lokmades" - Cinnamon and Honey Fritters, and "Daktyla" (Almond filled finger shaped pastries). Q: What are some characteristically Cypriot ingredients and flavourings? Are there any specialty products that are uniquely Cypriot in origin? A: The main ingredients used in Cypriot cuisine are lamb, chicken, fish, vegetables, fruit, yogurt, cheese and of course different spices: coriander seeds, oregano, thyme, cinnamon, pepper, caraway, parsley and garlic. Halloumi cheese originates from Cyprus. It is often served as a starter, grilled or fried (in slices as part of a cooked breakfast), in salads, and stuffed inside ravioli. Q: Tell us about some noteworthy grape varietals which are unique to Cyprus and are used in wine/spirit production? A: Wine has been produced on Cyprus for thousands of years – there’s proof of Cypriot winemaking dating back to 2000BC. It is believed that Cyprus was one of the first countries to cultivate the vine and lay out vineyards. One of the best known and oldest wines is "Commandaria", a sweet dessert port-like wine made from the grape varieties Xynisteri and Mavro. One of the legends says that Richard the Lion Heart conquered the island especially for "Commandaria" and proclaimed it "the wine of kings and the king of wines." It is also used for Holy Communion in the Greek Orthodox Church. Q: Do you have any anecdotes relating to Cypriot cuisine or food customs which stand out in your mind? 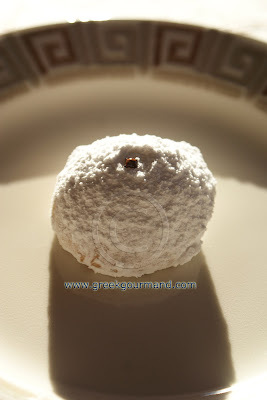 A: Cypriots eat a lot, especially during Christmas and Easter. I remember there was a year that over 1000 people visited the hospital emergency department suffering from stomach complaints caused by overeating. It’s now a national pastime exacerbated over any holiday period, and especially at Easter. ½kg (1lb.) of fresh vine leaves. (See note on vine leaves*). ½kg (1lb.) of fresh minced beef or pork, a mixture of both also works very well. If you are using fresh vine leaves, wash them and place in a large bowl and pour boiling water over them to cover, leave to stand until they change colour then remove them from the water. Allow to cool before using. If you are using packed vine leaves just wash them to remove the brine. For frozen vine leaves allow to defrost normally or just defrost in cold water. Fry the onion in a little olive oil, till golden, add the tomato and fry till reduced to a sauce, allow to cool. Put the mince into a bowl and add the rice, dried mint and seasoning. Add the sauce and lemon juice. Mix together till everything is evenly distributed. Take a vine leaf and place with the top side (shiny) facing downwards and the inside (veined) facing upwards. Place about a tablespoon of the mixture on the leaf near the stem part of the leaf. Fold the sides of the leaf inwards and the bottom part up, then roll up tightly into a cylindrical shape (make sure there is not too much mixture in the leaf, this comes with trial and error). Continue to do this until all the mixture has been used up. Place the rolled vine leaves in a large saucepan making sure to pack tightly. It's best to start on the outside edges of the saucepan and work in. Once the koupepia are in the saucepan, cover them with a plate (the plate should be big enough to hold them all in place so that they do not escape when boiling). Add water to the saucepan to come up just above the plate. Put saucepan on to boil and once it has started to boil, bring down to simmer. Cook for 20 minutes. Remove from heat and allow to cool for about 10 minutes before serving. 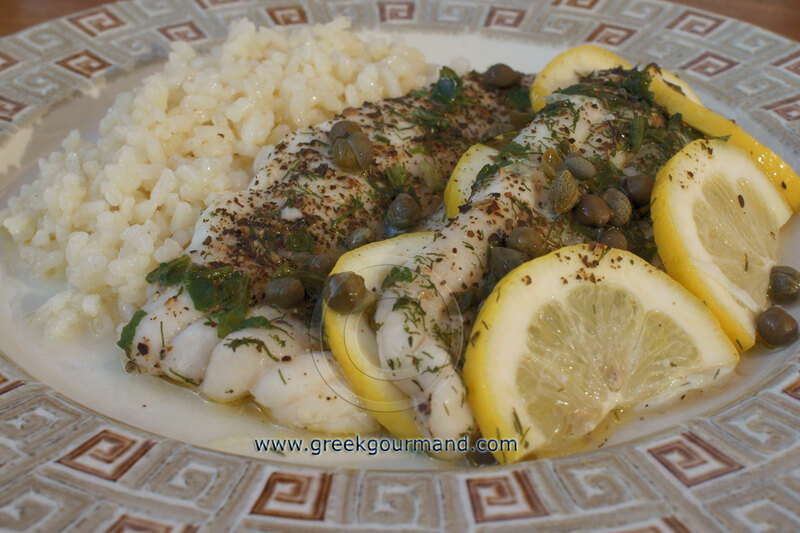 Koupepia can be served hot or cold, and garnished with some fresh lemon wedges. They are also lovely served with a salad. The best salad to serve them with is Glistiria which is another name for purslane (which is something like a sweet watercress). Glistiria is added to tomato and cucumber with some dried mint, oil and vinegar. The mint in the salad really compliments the koupepia. *Note on vine leaves: If you cannot find vine leaves for this recipe, Swiss chard leaves work very well, just wash and blanch them and use in the same way as vine leaves. If you are lucky enough to find fresh vine leaves, all the better, otherwise you can use preserved vine leaves, they come in brine or in vacuum packed bottles. If you have fresh vine leaves and you want to preserve them, the easiest way is to just blanch them, allow them to cool then pack the required amount in cling film or cellophane. Some people just pack them fresh without blanching them. Both methods work. If you find you have vine leaves left over after making the koupepia just wrap them in cling film and freeze them, they are OK to re-freeze. Finally, with fresh vine leaves you need to remove the stalks before filling. 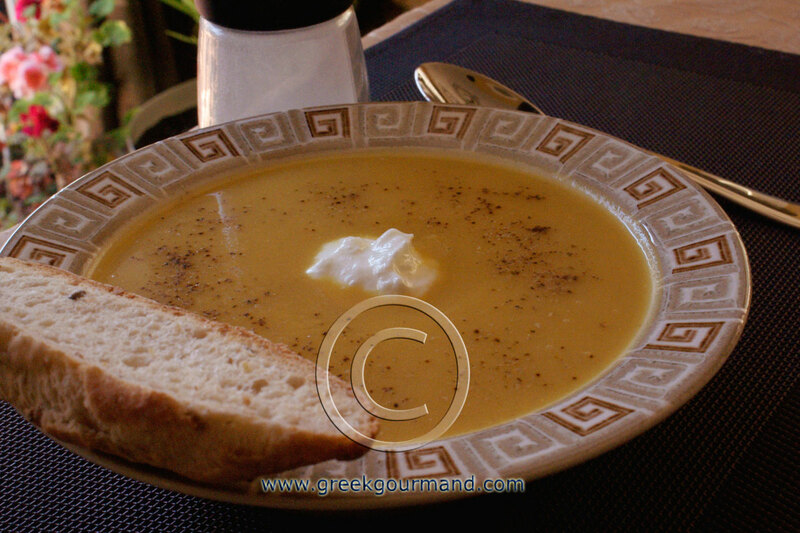 Once more, I wish to thank Mr. Avgoustides, Consul General of the Republic of Cyprus, for his invitation, the interview, and his recipe for Koupepia. Now that the first week of the New Year 2010 has come and gone, we have another fifty-one to look forward to, and I wish all of my readers the Very Best for the rest of 2010! I want to thank those of you who sent along your kind words and wishes over the Holiday period. Our family celebrated with a traditional cutting of the Vasilopita and a New Year’s Day late lunch at my in-laws’ home. It was a day filled with family, great Greek food, fun, and custom; we look forward to many more days filled with the same. In the spirit of ushering in a New Year with something novel, I offer my own spin on one of the classic dishes of Greek cookery: a baked bean dish that we call “Gigantes” (pronounced ‘YEE-ghan-dess’) after the name of the extra large runner beans that are its main ingredient. Five varieties of Gigantes beans have been registered as PDO/ PGI produce within the European Union by the Greek government. 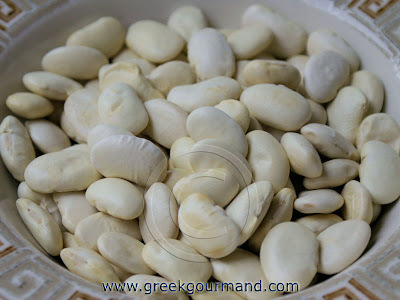 Gigantes beans are cultivated primarily in the area of Lake Prespa, in the north-western part of the Greek region of Macedonia, but they are universally enjoyed throughout Greece. Many of the local dishes in the northern Florina prefecture include variations on a red pepper theme. In particular, the spicy red “Florina pepper” (a cultivar of the species Capsicum anum) is used widely in regional specialties. This variety of pepper is peculiar to the area, and is much sought after in Greece and throughout the Balkans for its distinctive flavour and heat. Florina peppers are enjoyed in several ways; they are pickled (toursi in Greek), sliced raw into salads, as well as dried and crushed into red pepper flakes known as “boukovo”. Within Greece, the use of these peppers (and/or the boukovo flakes) in a baked Gigantes dish is unique to this locality. 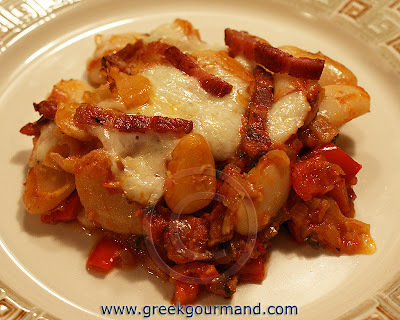 Now, I have long enjoyed southern Greek versions of baked Gigantes, but when I was first introduced to the spicy northern variation I was immediately hooked. I have a thing for spicy dishes, especially during the winter months here in Canada. Thus, I thought it might be fitting to share my own seasonal spicy and savoury variation on the classic baked Gigantes theme. In addition to the boukovo, I added two unconventional ingredients to my recipe: thick-cut bacon and mild-flavoured Cretan Graviera cheese. 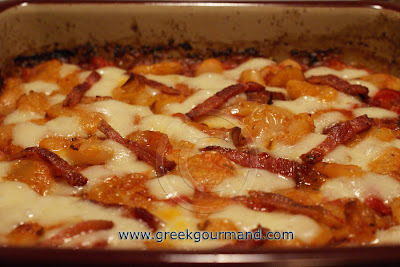 The result was simply mouth-watering and I hope you will give this Greek comfort food recipe a try. Soak the dried Gigantes beans overnight (use at least a 3:1 ratio of water to beans). Rinse and add rehydrated beans to a generous pot of boiling water and cook for 45 minutes over a medium heat, until the beans are soft. Using a large spoon, periodically skim away any surface foam that may develop. In a large sized skillet/pan, fry off the bacon until cooked but not completely crisped, then remove the bacon from pan but retain the fat. Cut the bacon into thin strips and set aside. Add the diced onion to the pan with the bacon fat and sauté until soft. Press and add garlic to the pan along with two tablespoonfuls of olive oil; stir for a few turns and then add the diced red pepper for several turns/tosses. Season with oregano, salt and pepper to taste. Stir in the tomato sauce along with 1 cup of water and half the bacon strips along with the chopped parsley and boukovo, bring to a boil, then lower heat to medium-low and let simmer for 15 – 20 minutes. Preheat oven to 375°F/190°C and place an earthenware/stoneware/clay baking vessel in the oven to warm. (I prefer to use a Pampered Chef ® square stoneware baking dish). When the beans are cooked (i.e. soft), drain them and add them to the pan with the sauce to combine. Take the heated vessel out of the oven, add the beans to it, pour the remaining olive oil over top and return to oven. Bake for 35 minutes. Remove baking vessel from oven; add cubed cheese and bacon strips over top of the beans and bake for another 10 minutes until the cheese has melted. Serve immediately along with some chewy sourdough village-style bread. Note: If you like Gigantes beans, you may also enjoy my Pan-Fried Gigantes recipe.